In a surprise move, the U.S. Army is asking industry for ideas for a new submachine gun. The last time the Army adopted a submachine gun was in 1943. It’s not clear why the Army wants a new subgun but it likely has to do with the service’s eventual adoption of a new rifle caliber and new assault rifle. Submachine guns were developed during the World War I as an alternative to bulky, slow-firing bolt action rifles. Short and firing pistol caliber ammunition, they were ideal weapons for assault troops clearing narrow trenches of enemy troops. 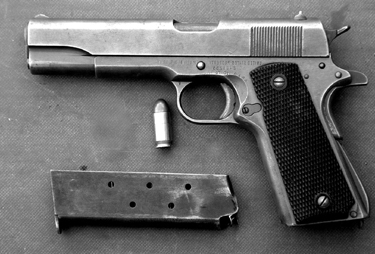 The U.S. Army went into World War II with the M1928A1 Thompson submachine gun, which fired the same .45 ACP round as the M1911A1 pistol. 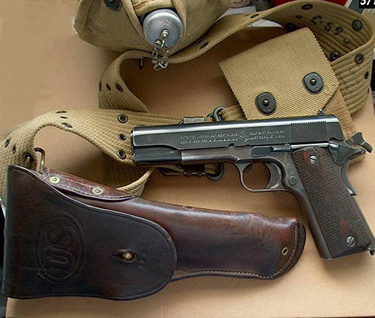 Towards the end of the war the Thompson was supplemented by the M3 “Grease Gun”, also in .45 ACP. 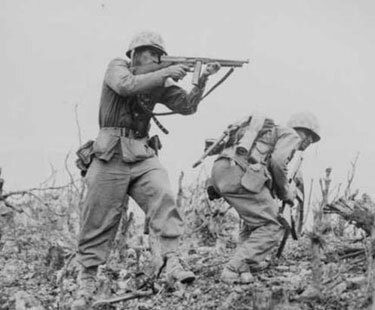 Submachine guns were eventually replaced in many armies by shortened assault rifles, which used heavier assault rifle rounds while still physically compact. In the U.S. Army, the M3 was used up through the 1991 the Gulf War by vehicle and by Delta Force. According to The Firearm Blog, the U.S. Army has posted a Request for Information from the defense industry for a new submachine gun. The RFI is for a Sub Compact Weapon (SCW) that will fire 9×19-millimeter (9mm Luger) ammunition, have full automatic capability, a Picatinny rail for attaching lights, optics, and other accessories, and mentions the capability to mount a suppressor. The United States Army announced they will be dropping hand grenade and land navigation competency as requirements for basic training graduation. 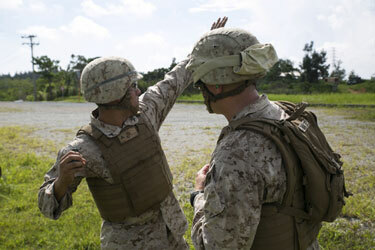 Reasons cited to drop the grenade competency: People are growing up never learning how to throw. That’s right. Too many people are going into the army who never learned how to throw as a child. The Army does not have the time to teach all the adults how to properly throw. How far does the grenade have to be thrown? Only 20 – 30 meters. Which equals between 60 – 90 feet. However, just because the two were dropped from basic training does not mean the skills will not be taught. They will just be taught at a later time. From Military.com – Low Recruit Discipline Prompts Army to Redesign Basic Training. 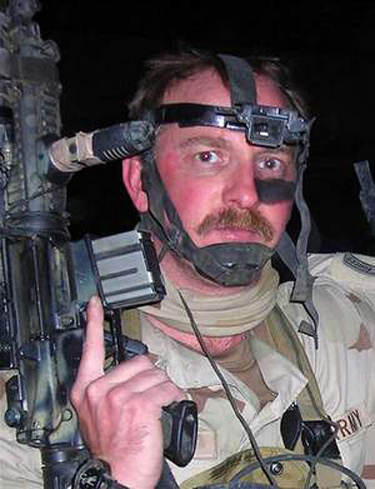 “We are finding that there are a large number of trainees that come in that quite frankly just physically don’t have the capacity to throw a hand grenade 20 to 25 to 30 meters. The whole article is a very interesting read. The part about the new recruits lack discipline and have a sense of entitlement should be a concern. 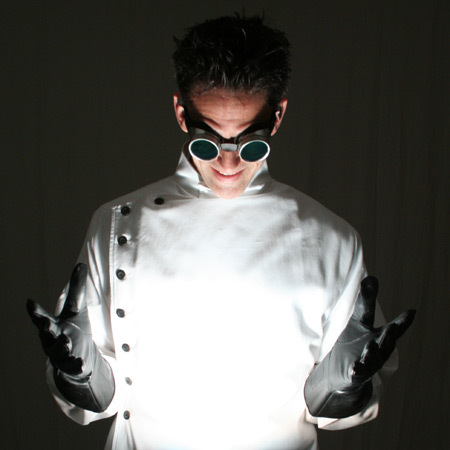 The U.S. Army Training and Doctrine Command is pleased to announce its first Mad Scientist Science Fiction Writing Contest and will accept submissions between November 22, 2016 and February 15, 2017. The topic for this competition is “Warfare in 2030 to 2050.” Writers from all walks of life have the opportunity to contribute ideas that are outside what the Army is already considering about the future. These stories are being used to explore fresh ideas about the future of warfare and technology. Writers are asked to consider (but not limited to) how trends in science, technology, society, the global economy, and other aspects could change the world in a meaningful way, with implications for how the Army operates in future conflicts. The winning contestant will receive an invitation with most expenses paid to the concluding 2017 Mad Scientist Conference co-hosted by Georgetown University, Center for Security Studies, School of Foreign Service, Washington, D.C. Submissions selected as runners up will be published in one of several professional military journals. For more information and guidelines for the competition visit the TRADOC G2 2017 Mad Scientist Conference Science Fiction Writing Contest Page or contact Allison Winer at allison.d.winer.civ@mail.mil. People Magazine (not exactly a rabid conservative source) reports that the two female candidates successfully passing US Army Ranger School for the first time last April had more than a little special help. [T]he women got special treatment and played by different rules,” sources say. Ranger School consists of three phases: Benning, which lasts 21 days and includes water survival, land navigation, a 12-mile march, patrols, and an obstacle course; Mountain Phase, which lasts 20 days, and includes assaults, ambushes, mountaineering and patrols; and Swamp Phase, which lasts 17 days and covers waterborne operations. But whereas men consistently were held to the strict standards outlined in the Ranger School’s Standing Operating Procedures handbook sources say, the women were allowed lighter duties and exceptions to policy. The end result? Two women – First Lts. 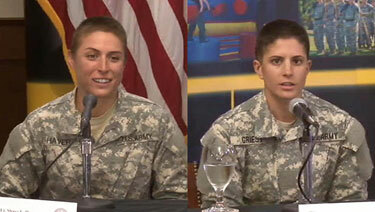 Kristen Griest and Shaye Haver – graduated August 21 (along with 381 men) and are wearing the prestigious Ranger Tab. Griest was surprised they made it. At their graduation, Maj Gen. Scott Miller, who oversees Ranger School, denied the Army eased its standards or was pressured to ensure at least one woman graduated. “Standards remain the same,” Miller said, according to The Army Times. “The five-mile run is still five miles. The 12-mile march is still 12 miles. “There was no pressure from anyone above me to change standards,” said Miller, who declined to speak to PEOPLE. The women didn’t want or ask for special treatment, says one who attempted the program. On September 2, the Army announced that Ranger School is now open both to men and women. 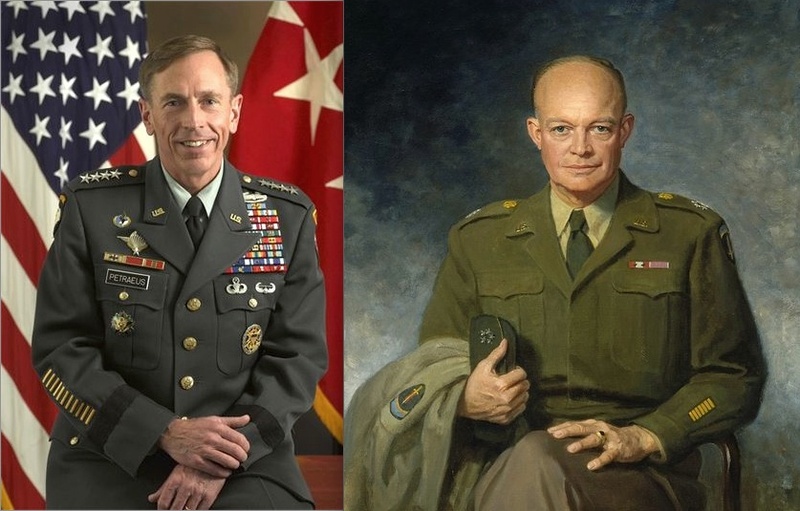 David Petraeus wore regularly a lot more awards than Dwight Eisenhower did many years ago. Marines have long remarked humorously on the proliferation of awards, badges, and decorations worn by members of the US Army. General Petraeus’s resignation as CIA Director recently even provoked comment from left-wing commentators, like Andrew Sullivan, on the questionable taste of contemporary doggie custom. The Marines, of course, are a lot better qualified to criticize in areas of this kind than are foreign poofter journalists who make professional careers of Dolchstoß-ing those who protect them from big bad sand monkeys who would do them harm. The legitimate, original photo of Chinese officers. Photoshopped parody. 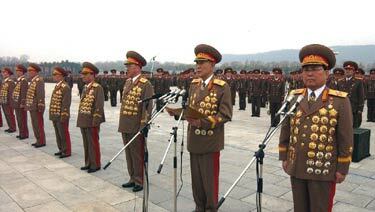 There are medals even on the sleeves and trousers. For Veterans Day, Major General Jerry R. Curry shared a memory from the War in Vietnam. It was the spring of 1971 and Captain Larry McNamara, one of my advisors to the South Vietnamese Army (ARVN), and I were sitting across from each other on a hot, sparsely covered jungle hillside sipping bitter Vietnamese tea. In between us was a fold-up wooden military campaign table. My other advisors sat silently apart from us under a clump of pine trees pretending not to be eaves dropping on our conversation. They were cleaning and oiling their weapons, preparing for combat, deep in the jungle. Occasionally their eyes wandered toward us. A week before, Larry had been deserted and left to die out in the jungle by the Fourth ARVN Battalion commander, Major Uy. Uy was a first class coward and Larry’s returning alive was an embarrassment to him. If Larry had died as Uy intended, Uy could have fabricated a story about the fighting having been so intense that he and Mac had been forcibly separated and he had risked his own life trying to find him. But because Larry had defied all of the odds and come back alive, Uy was forced to explain why they had become separated. According to Uy’s version of events, he had become so deathly sick that he was unable to lead his battalion. So he was forced to make his way back to the rear to find medical help. 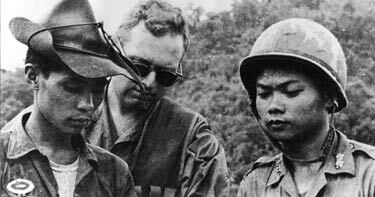 Most of the other ARVN officers and senior sergeants had followed him. Larry had ended up commanding the encircled ARVN remnant and was able to lead them to safety. “Colonel, you know as well as I that at the first shot fired, he will turn tail and run and the battalion will fall apart, just like it did last week.” He was stating simple, unemotional fact. Simultaneously we pushed our metal folding chairs back, stood, and shook hands. “Goodbye, Colonel,” he said. “We won’t meet again … at least not in this life. Write my wife, tell her I love her.” I nodded and he was gone. The US Army has invited gun makers to submit candidates for the next US primary long arm, which they intend to be a carbine. The Army has given gun makers that want to build your next carbine 90 days to throw their hats in the ring. The message is clear: The Army isn’t looking for the lowest bidder, it’s looking for the most accurate, efficient, quiet, lethal and reliable weapon available. 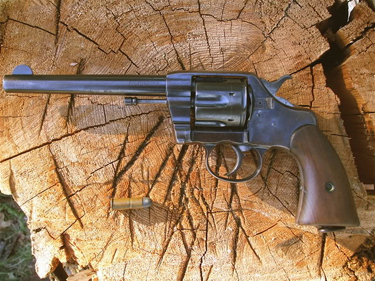 The RfP allows competitors to submit only one weapon for consideration. There are no caliber restrictions. Although many modern carbines are multicaliber weapons, they will compete with one caliber. And if a weapon’s caliber is not 5.56mm or 7.62mm, the manufacturer must provide 234,000 rounds to cover all tests. • Cost. 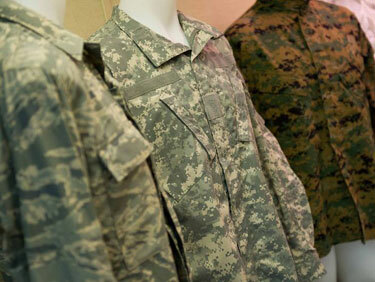 The Army says performance factors are more important than price. It is interesting to note that the Army specifies that they want a carbine. Carbines are shorter, characteristically somewhat less accurate, versions of a rifle, used traditionally by mounted cavalry which would find carrying a full-length rifle awkward and inconvenient. Infantry are normally armed with rifles. Besides being more accurate, the full-length rifle is superior to the carbine in some other crucial respects. Inevitably in war, there are occasions when hand-to-hand combat occurs in which the infantryman’s rifle is required to be used in the capacity of a spear or a club. The rifle is more suitable for use with the bayonet, and being heavier than the carbine is more effective as a blunt weapon. The current US Army does not expect any longer to march to battle on foot, and instead functions as motorized or air mobile infantry. The modern infantryman has, thus, become the equivalent of the 19th century dragoon who rode to battle on horseback, but dismounted and fought with carbine on foot. Experience in the Middle East has demonstrated the inadequacy of the 5.56mm service round. Let’s hope that the Army comes to its senses this time and opts for a more serious cartridge. Ten years ago, General Eric Shinseki, the Army Chief of Staff, decided to improve the morale of the ordinary soldier by allowing him, too, to don the chic and sporty black beret, previously worn only by elite Ranger units. Apart from all that, berets are pretty silly looking and they don’t keep the sun out of your eyes. They are fussy to put on, needing a lot of adjusting, and they really look goofy with the digital pattern desert camouflage Army Combat Uniform used operationally every day. Soldiers didn’t like it and Army Secretary John McHugh decided to bow to their wishes and pulled the plug on the beret on June 14th. The headgear of French poets and girl scouts will be replaced by the patrol cap. the Archives of Never Yet Melted in the 'US Army' Category.